When Bob and I made the decision to spend a week in San Blas, in Mexico, it was not done lightly. Reports that listed the area as not the safest to travel to gave us pause for consideration, but the promise of seeing endless numbers of tropical birds had us braving the cross-country trip from Zitacuaro. We are forever grateful for having gone ahead with our plan. We saw loads of interesting birds not the least of which were numerous Black-necked Stilts. 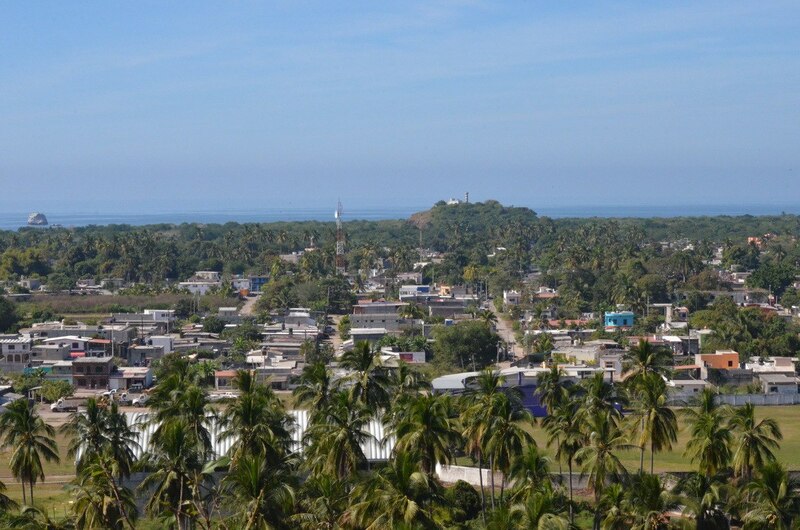 San Blas is a tidy little port about a 4-hour drive north of Puerto Vallarta, but we reached the community by driving cross-country from the state of Michoacan not far from Mexico City. Touted as a tropical paradise for birds and birdwatchers, San Blas is surrounded by mangrove swamps, estuaries, lagoons and beaches. 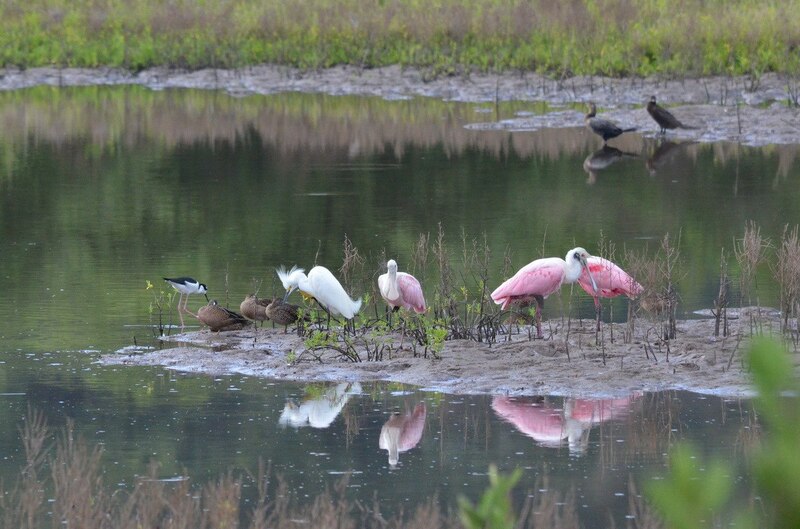 The ideal habitat provides one of the most important shelters for birds in the Western Hemisphere. As promised, most of the 300 bird species that make this place home are within easy reach from San Blas either on land or by water. 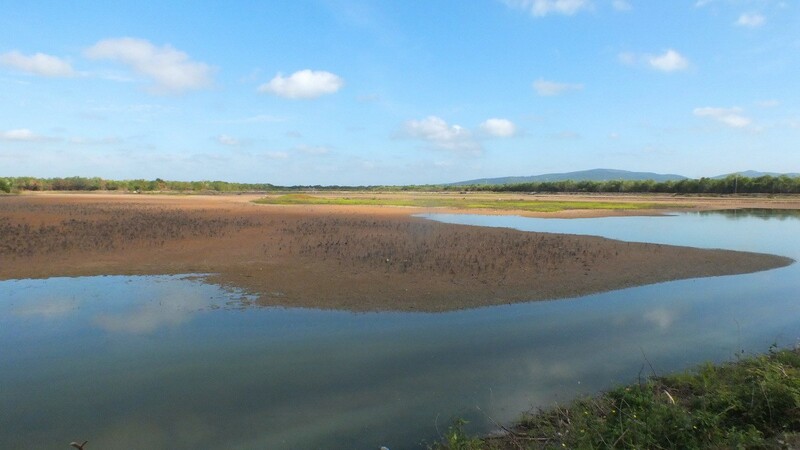 Just north of the community, along Shrimp Pond Road, are a series of Shrimp Ponds where shrimp and crabs are raised, and this is one place that was recommended as a hot spot for shorebirds. 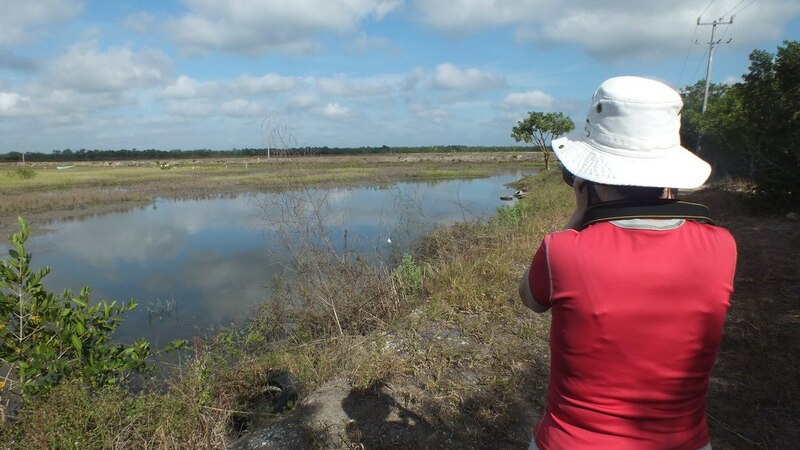 Our objective one morning was to check out the Shrimp Ponds to see if any birds were on site, and when we hopped out of our car onto one of the embankments that shoulders the Ponds, Bob and I immediately understood that we would be there for awhile. 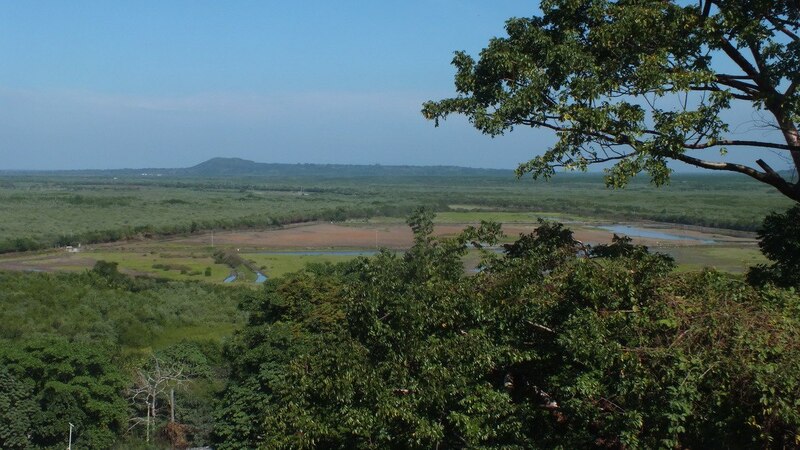 Not only was it quite a vast area, perhaps several hectares, but there were umpteen birds in the water and on the mudflats. It was going to be fun exploring the wetland area to see just how many species we could uncover. Black-necked Stilts come by their name honestly. 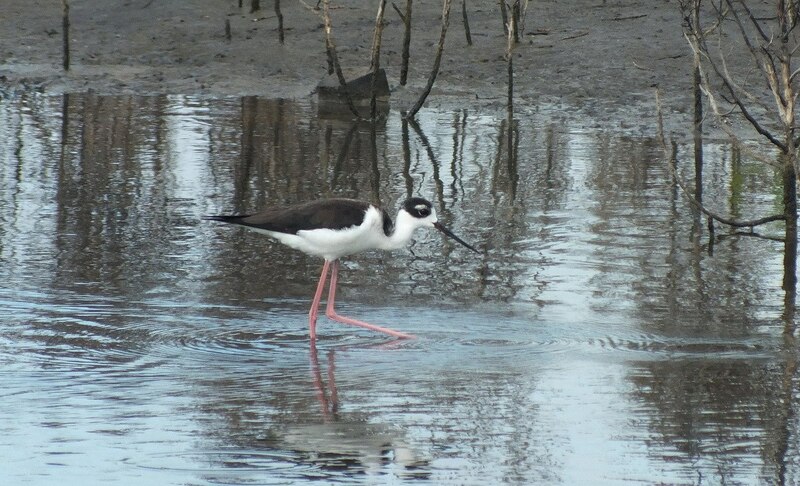 Their uncommonly long, thin reddish-pink legs make the bird look like it is walking on stilts. This species has the second longest legs in proportion to their bodies of any bird except Flamingos. 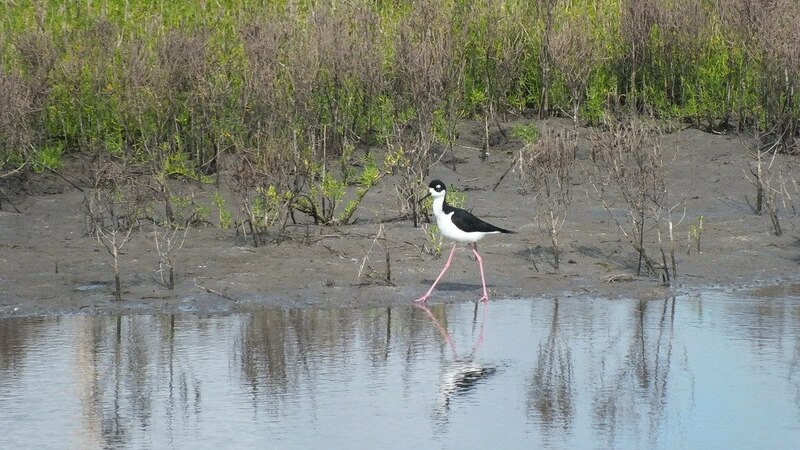 Our first impression of the Black-necked Stilts is that they seemed very delicate. Everything about them makes them look fragile…from the long, thin, needle-like bill to the slender long legs, their slim wings to their lengthy neck…and yet they are shorebirds that survive nicely in shallow, open wetlands totally exposed to the brutal sun. 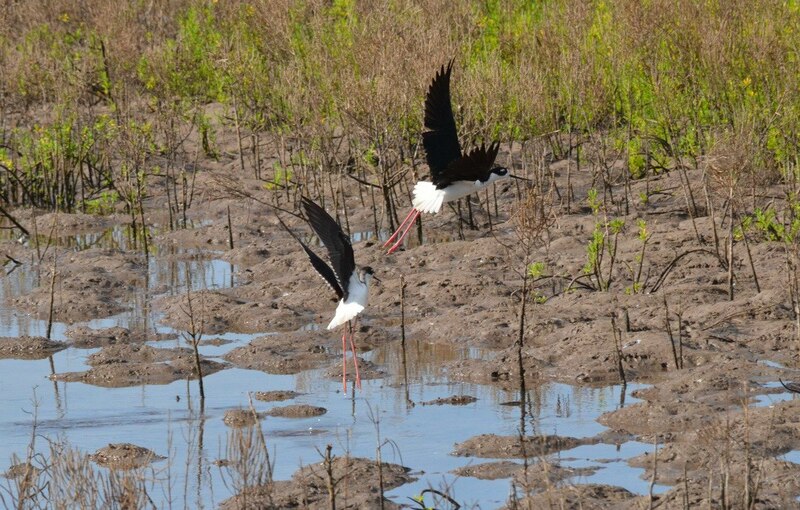 The Shrimp Ponds with their sun-baked mudflats and shallow water provide a perfect habitat for these striking black and white birds. 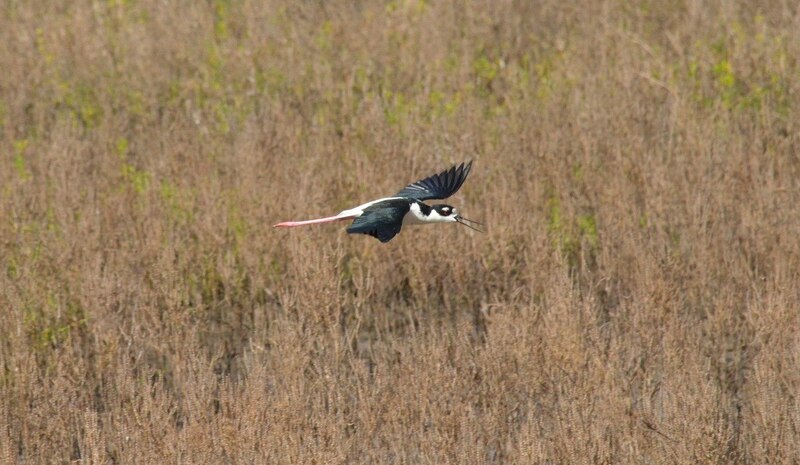 Any shallow body of fresh or alkaline water in open country will attract Black-necked Stilts because they like to nest on open ground with little vegetation but in close proximity to water where they can forage for food. 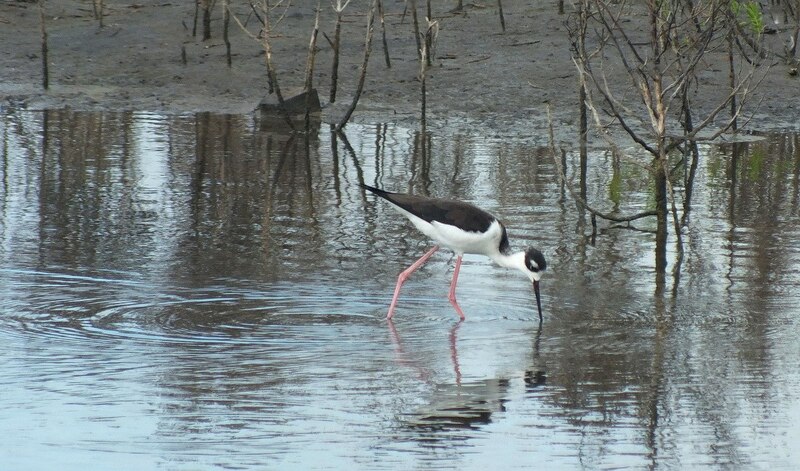 Certainly there are many different habitats that would meet the needs of Black-necked Stilts such as grassy marshes, coastal estuaries, and flooded fields or lakes, but in this case, the shrimp and crabs that are being raised in the vast spread of shallow lagoons, as well as an abundance of small fish that had the ponds roiling, guarantees a constant source of food. 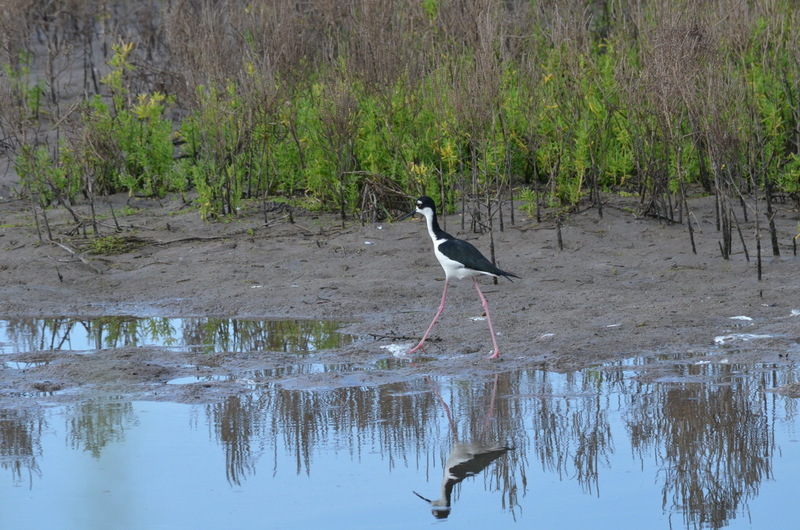 Black-necked Stilts are built to wade through shallow water in search of prey. With such long legs, they can even wade into deep water right up to their bellies. 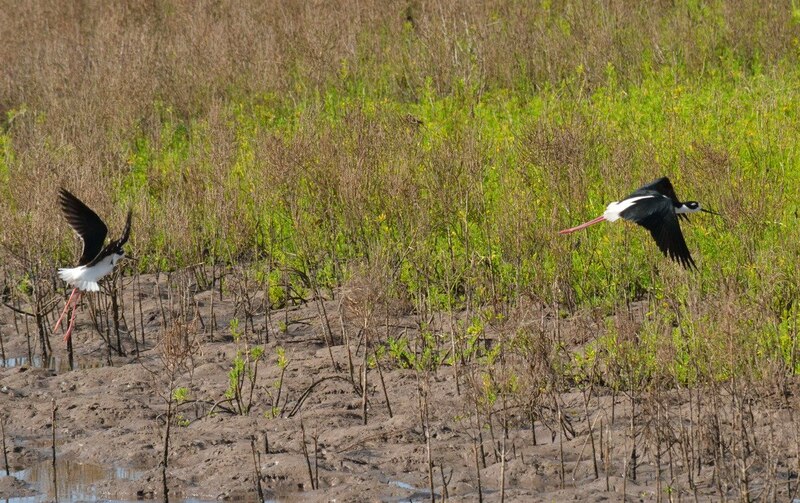 Black-necked Stilts most often identify a food source visually and look for small fish, insects, tadpoles, crustaceans, snails, worms and even seeds of aquatic plants. Their long thin bill makes it easy to pick any of these items from the surface of the water or plucked from the mud, but should a Black-necked Stilt spot prey beneath the surface, the bird will not hesitate to plunge its whole head underwater in order to nab it. 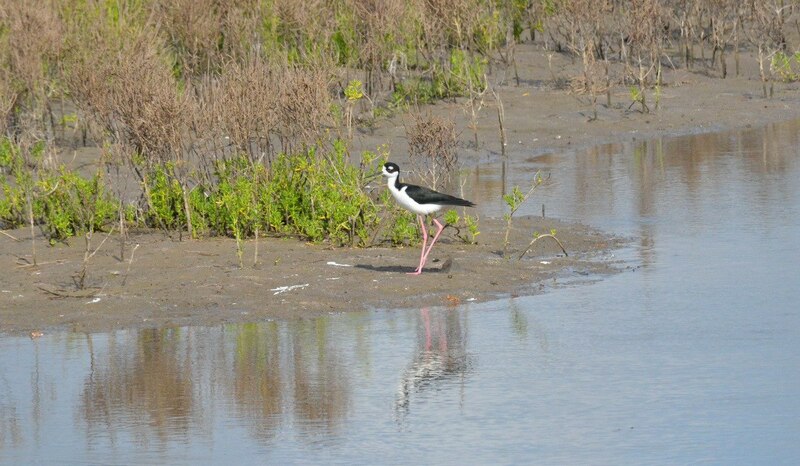 As this Black-necked Stilt strutted along the muddy shore, Bob noticed that its feet are partially webbed. 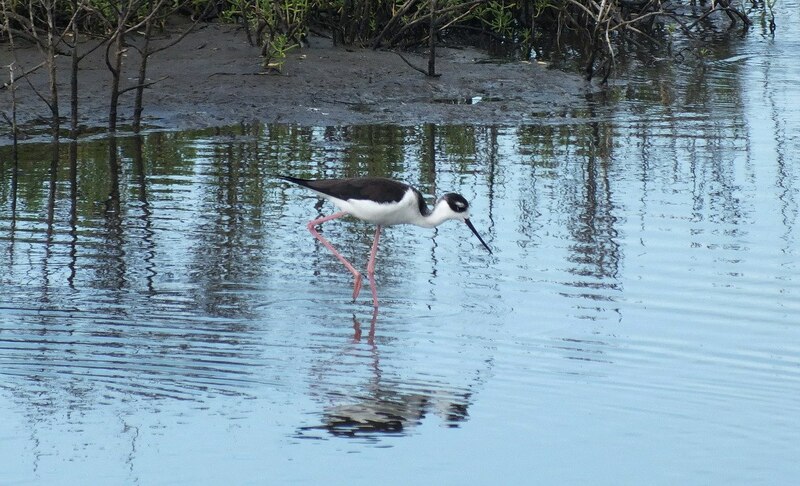 We later learned that the partially-webbed toes enable a Black-necked Stilt to swim in deeper water if it is necessary to seek food there and even to propel itself when diving, which is done only if a bird feels distressed or threatened. Another very interesting fact is that a Black-necked Stilt is capable of using its wings to swim for short periods of time. While Bob and I patrolled the numerous berms that crisscross the Shrimp Ponds, there was constant activity in the water and through the air. 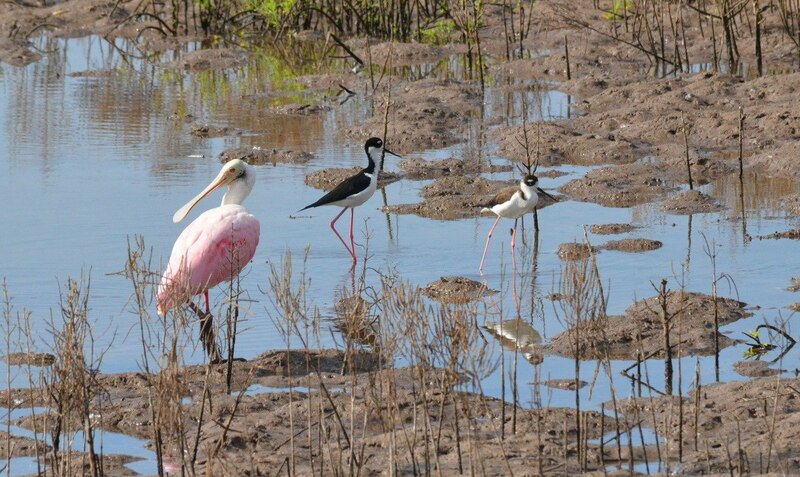 If it wasn’t Roseate Spoonbills slowly crossing our line of vision, it was the graceful Black-necked Stilts. It was while these birds were in flight that we could really appreciate their black back and wings set off by their startling white tail. 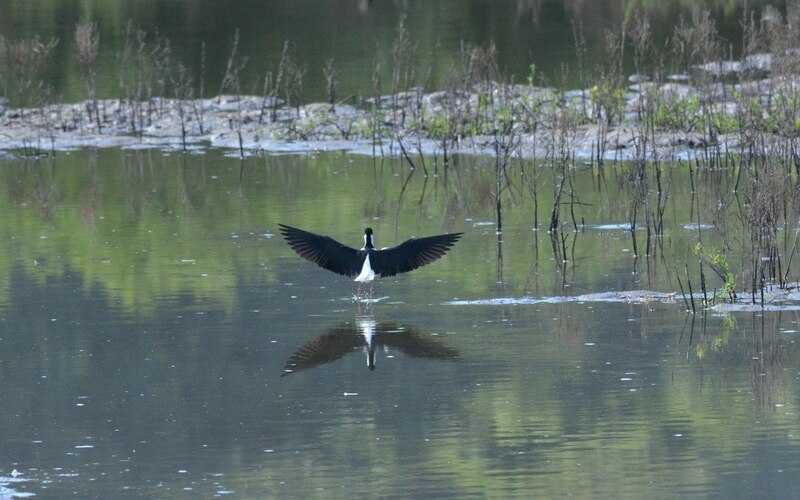 The wingspan of a Black-necked Stilt can be between 63-73 centimetres (25-29 in). If predators were to threaten a Stilt or its offspring, aerial maneuvers are performed with the impressive wingspan assisting in that endeavour, but it also comes in handy when a group of adult Stilts joins together to ward off a threat. In what is called “the popcorn display”, the Stilts form a circle around a predator and hop side to side while flapping their wings. That would make one impressive sight. 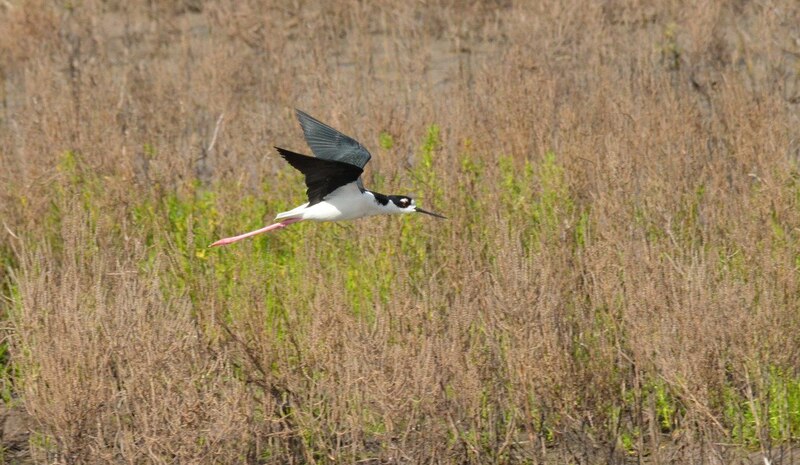 Winging its way above the Shrimp Ponds with its legs trailing far behind, this Black-necked Stilt moved quickly using strong, steady strokes. We saw many of the birds swoop from one feeding location to another where they would form a “dragnet” with about a dozen birds. By spreading out, they could essentially herd fish to the shore and then capture them. Of all the Black-necked Stilts that we photographed, there was only one that we could identify as a juvenile or female because of its brown back. Males have black plumage extending from the cap on their head down the back of the neck and along the back of the body. If the light is just right, a distinct greenish iridescence can been seen on a male’s back and wings. 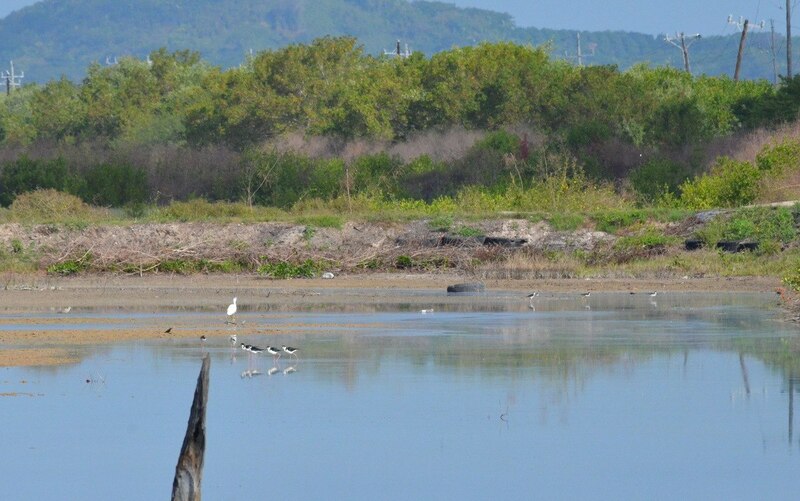 Over the course of a couple of hours, under the relentless Mexican sun, Bob and I circulated among the Shrimp Ponds and never tired of the solitude nor the continuous parade of shorebirds. The Black-necked Stilts were some that we had never before seen, so we delighted in observing their gregarious behaviour and showy maneuvers.